“Isn’t is great . . . I have a God who cares about what I eat for lunch.” So declared a Jewish man who was asked about the heavy burden of his dietary restrictions. As a member of the Church of Jesus Christ of Latter-day Saints (Mormon), I also have a God who cares about what I eat for lunch. So do the Seventh-day Adventists. And so do you. Welcome! 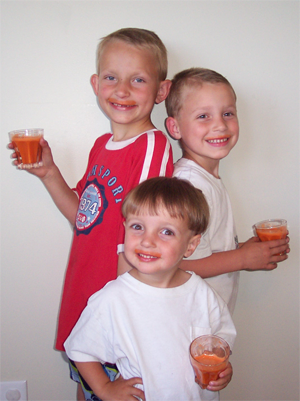 I don’t know if God likes carrot juice, but I think he must. When someone is unable to eat well because they are too ill or too fussy, fresh vegetable juice with the fiber removed may help them more easily absorb needed nutrients. Supplements and medicines are formulated by mere men; we prefer the nourishment designed by the Master of the Universe, the Father who really does know best. My husband and I joined the Church of Jesus Christ of Latter-day Saints in 1964, in our early twenties. We were the standard, clueless products of the 50’s and 60’s. Neither of us had any religious background, although we would later find out that my husband had early Mormon ancestors from Denmark who came by ship and train to Salt Lake. I’m sure they had something to do, from the other side of the veil, with the events that brought us into the gospel net. The day the missionaries taught us about the Word of Wisdom, my husband handed them his cigarettes. They left us a pamphlet to read about Section 89 of the Doctrine and Covenants of the church, which defines a healthy diet. In it the Lord said “it is pleasing unto me that [animals] should not be used, only in times of winter, or of cold, or famine.” Living in warm, famine-free Southern California, we thought we were joining a vegetarian church. Well, ok. Then we went to our first church social, a ham dinner. During those earliest years I studied the words of prophets by special ordering the Journal of Discourses from the library. I found much support from early Church leaders. I studied the science by reading books, some from the health food store. Elder Sterling Sill commented once in a Church magazine that he had read in a book that when we have a boil on our skin the problem is in the blood underneath. I wrote and asked him what book it was, and he wrote back, giving me the name of the book and the name of the health food store in downtown Salt Lake where it could be found. All these things strengthened my testimony. When I was expecting our fourth child and we had just moved to Utah, I was determined to have her at home. It was a new idea and I was terrified, but it had to be better than my third hospital delivery had been. So I asked around for the name of a doctor or a midwife, and someone sent me to a Seventh-Day Adventist doctor who had done home births in the past. He no longer did them, but I held out hope. I was in his office, in early labor, when he finally gave in and asked his nurse, who was his wife, if she wanted to “catch a baby,” probably later that day. She agreed and he sent me home. We had gone just a few blocks when my labor changed. We turned around and my husband dropped me off at the door. He parked the car, and when he walked back into the waiting room the people there said, “Hey buddy, that’s your baby crying.” There was a health store connected to the medical office, so they wrapped our sweet little girl in a blanket and laid her in a carrot box while they took care of me. The symbolism did not escape me, nor did the tender mercy of the Lord. I love the Seventh-Day Adventists for their commitment to healthy, vegetarian living — which is stronger than that of most members of the Latter-day Saints. They also maintain their own schools, which I admire. From time to time we did find other church members who believed as we did, but together we could hardly call ourselves a growing movement. We continued to follow the Lord’s “sparingly” request at various level of commitment as we raised our children..
Over the next several decades, we carried on the best we could, but there was a major gap in my understanding. I seldom ate meat, but oh, how I loved the ice cream and cheese. I never occurred to me that milk is not a plant! All my adult life I had semi-annual bouts of respiratory illness – strep, bronchitis, etc. One of those “minor” illnesses cost me the privilege of attending the temple with a daughter to take out her endowments, and I was not much better a few days later for her wedding. In fact my sister-in-law said that when she arrived from out-of-state she thought I was dying. I had other health problems, and my weight was very high. I knew I was headed for trouble. Then in 1996 someone mentioned that a man was teaching about the Word of Wisdom at a local library. I went to hear him and he changed my life. I invited him to our home to speak to some friends and family, and he taught us the scientific differences between plant foods and animal foods. Our married children were not interested except for one daughter-in-law, bless her heart, and she and her husband joined us in a new dietary challenge, as did our three younger daughters who were still at home. Millie, the oldest of the three, loved to cook. (As a non-cook, I prefer to fix nothing with more than three ingredients.) Over the years Millie developed recipes that would taste good to the non-vegans in the family. She and her two younger sisters are now raising vegan children and their spouses eat vegan. Other family members are beginning to make changes, so most of our posterity is either vegan or knows they should be. I have collected many, many pieces of evidence over all these years, and now I would like to share them. If I post one piece a week it will take me years to go through my files; but I want to do this for my posterity if nothing else. I hope you will join us too. Better eating means better health. Better health makes us more useful to the Lord and protects us from our enemies.